Use with 3M™ Respirators 5000, 6000, 7000 and FF-400 Series, according to NIOSH approvals. Designed to protect against a variety of gases, vapors and particulate hazards. When properly selected, cartridges and filters help provide protection from a variety of contaminants. *Nuisance level organic vapors refer to concentrations less than the OSHA PEL or applicable government occupational exposure limits, whichever is lower. Do not use for respiratory protection against organic vapors. **Nuisance level acid gases refer to concentrations less than the OSHA PEL or applicable government occupational exposure limits, whichever is lower. Do not use for respiratory protection against acid gases. ***3M™ recommended for ozone protection up to 10 x OSHA PEL or applicable government occupational exposure limits, whichever is lower. ****OSHA regulations require gas proof goggles be worn with half facepiece respirators when used against formaldehyde. (Not NIOSH certified for use against ozone.) 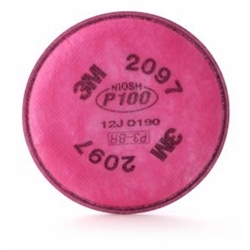 Only 3M™ filters 2000 Series, 7093, 5N11 or 5P71 are approved for use with 3M™ 5000 Series Respirators. Cartridges cannot be replaced.